Recite as much as possible. Afterward, one should engage in the four bodily activities (moving, sitting, sleeping, and walking) from within the state of the Guru of Natural Intrinsic Awareness (rang rig bla ma). 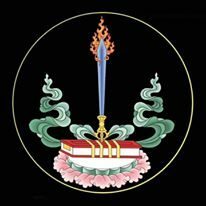 And so it was that on the great festival for the gathering of Ḍākinīs (mkha’ ‘gro ‘du ba’i dus chen), during the Monkey Month of the Fire Bird Year of the sixty year Tibetan astrological cycle (rab gnas), this was composed in writing thus by Śrī Émaho, in accordance with the heartfelt commitments of his heart-friend, Ḍākinī Rigdzin Yangch’en Lhamo (mkha’ ‘gro rig ‘dzin dbyangs can lha mo); without hiding or concealing anything which arose from within the expanse of Intrinsic Awareness: May it be virtuous.